In boxing, there is only one thing that is truly undefeated, and that is father time. Some fighters avoid it, getting out before the punches catch up, and others stay too long and pay the price for it. In part 2 of my exclusive interview with Carl Froch, he gives his thoughts on how long he thinks he can keep fighting and when he thinks it will be time to step out of the game. 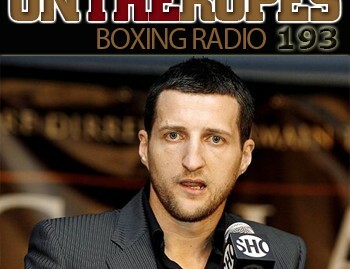 Froch also discusses some hot topics going around the boxing landscape. 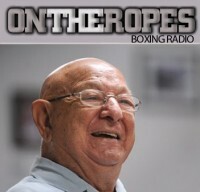 He talks about the upcoming Mayweather-Canelo fight and who he is favoring. 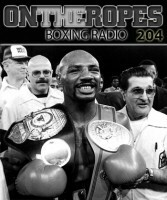 Additionally Carl touches on the rumored David Haye vs. Tyson Fury fight & how he expects it to play out and more! Here is what Carl Froch had to say. Jenna J: Right, well Carl, right now at this point you’re 35 years old, you’re gonna be turning 36 soon enough, but right now you’re fighting at your elite. I was talking to you about this before, you seem to be getting better with age, how long do you realistically think you can keep going at this level? Carl Froch: I think I can keep going for as long as I want to keep going, as long as the desire’s there, I’m going to keep fighting. I’m 35 years old but I’m very, very young. I don’t take many punches, I work hard in the gym, I’m very slim and strong. In a weight governed sport that’s very important. But how long do I want to keep fighting for? My desire answers that for me, at the minute the desire’s there. I’m looking forward to getting up in the morning and training again and getting back in the gym. Even with 2 1/2 to 3 weeks off I’m ready to get back in the gym. In fact this morning I got up and went for a run and I’ve been doing my press ups and my groundwork. Rachel’s just been looking at me saying “what are you doing press ups for?” Well I just enjoy doing them, I like to keep my body in good shape and keep strong. Physically, Father Time does catch up with you eventually but current fighters and fighters over the past have proved that you can keep going as long as the mind’s willing and the body is ok to the point where the body is not unable to do what the mind wants to. At the minute I’m 35 and I’m feeling very much in my prime. I’m not going to say at 37-38 I’m finished or 2 or 3 more fights and I’m finished because at the moment the desire’s very strong. Jenna: Well Carl, right now in your career you’re getting up there in terms of not just notoriety but in terms of all time British fighters and a lot of people have you up there with some of the greatest and they say if you avenge your only other loss, being Andre Ward, that you could maybe one day have yourself down as the greatest British fighter. What would that mean to you to be up there, to be the greatest? Froch: It’d be phenomenal. It’s a sport I love. I love boxing, it’s what I do for a living and I’ve always loved the sport since I was an amateur. So to be named by the people that count, as one of the greatest would be phenomenal. It’d be unbelievable, surreal, it’d be an accolade that I’d be very, very proud of. Jenna: I’ve just got a couple more questions for you, Carl, before I let you off the line. Some interesting things going on in the boxing scene right now. Floyd Mayweather Jr. is taking on Canelo Alvarez in September. What do you think of that fight? Froch: I think it’s a great fight. I think that Alvarez is a fantastic talent, he’s a very good man, very strong, very gifted, very skillful. He punches hard and he’s got a very determined mind set. He’s aggressive when needs to be and he can also box and move. He’s got a good defense. I think he potentially poses problems for Floyd Mayweather. Do I think he can beat Floyd Mayweather? It’d be difficult to beat Floyd Mayweather. If I was a betting man, which I’m not, my money would be on Floyd Mayweather to win and that’s purely because that’s what he does, he wins. Time after time after time. He always fights the best of the best. I always say I take on all comers and will fight anybody, well if you look at Floyd Mayweather’s resume, he fights all of them, he fights the best of them time after time. So I can’t say anything against Floyd Mayweather. I just think he’s phenomenal, he’s brilliant, he’s talented. I’ve got so much admiration for him and respect for him. I just feel he will beat Alvarez, not that Alvarez has got anything wrong with him stylistically or he’s a poor fighter, because he’s not, he’s a great fighter is Alvarez. He’s brilliant but I just think Floyd Mayweather can beat anybody. Technically and defensively I think he’s too good for anyone. Period. Jenna: Another fighter out there who still gets a lot of attention is Manny Pacquiao. 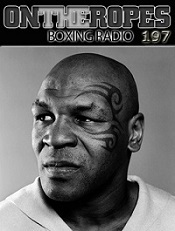 He’s coming back against Brandon Rios. A lot of people have been saying it’s a bad fight for Pacquiao to fight somebody of that style, what do you think? Froch: Yeah I agree with that it could be potentially a bad fight for him. He’s not looked as fresh recently. It looks like Father Time, as we were talking about earlier, is catching up with Manny Pacquiao. 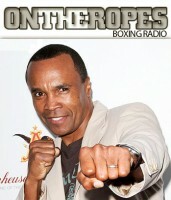 He’s been knocked out by Marquez and he didn’t look that good when he fought Shane Mosley. I didn’t think his work rate was as high as it had been in the past. Maybe time is catching up with Manny Pacquiao, he needs to be very careful. I don’t know much about his opponent if I’m being totally honest but if he’s fighting anyone at the top level then he needs to be careful because his last fight was quite disastrous. I mean anybody can walk into a shot and get knocked out, anybody, but has he reached the end of his time? Maybe, maybe not. We’ll certainly find out. Jenna: Right, well there’s one fight that the British boxing scene has talked about and has gained a lot of interest: Tyson Fury vs David Haye. What do you think about this fight if it actually comes together? Froch: I think it’s a big fight, it’s an interesting fight. It’s definitely one for the fighters to get excited about as well as the non-boxing fan because it’s heavyweight. Heavyweight always seems to attract non-boxing fans attention for whatever reason. It’s always a big deal, but potentially it’s a good fight for a few rounds but I just feel that the first heavy shot that David Haye lands, and he will land it because he’s very, very good at what he does David Haye. He’s aggressive, he’s very tenacious, he puts his shots together well and against somebody like Tyson Fury who’s been flattened a couple of times, he’s been put down a few times, Cunningham put him over quite heavily in the last fight. He got up to win, you’ve got to give him credit for that but I think someone who’s aggressive like David Haye who’s been in there with the best of them…I just think David Haye beats him and beats him comfortably by knockout. Jenna: At this point do you see the point of David Haye continuing to fight? He doesn’t seem as interested as much in the Klitschkos anymore. I seems like he’s more interested about money, how do you see it? Froch: Well yeah. I mean at this stage of his career why shouldn’t he be more interested in money? He’s got plenty of money, he’s done very well. He’s had a lucrative career in terms of earnings but we’re not in there for trophies or medals, we’re in there to get paid. That’s his livelihood. If he wants to come out of retirement at the age of 31 and fight in a big fight and earn millions of pounds, who’s anybody to tell him he can’t do it? The heavyweight division is wide open. There’s lots of interesting fights for him, Wladamir’s already beat him, Vitali’s about finished, so the division’s wide open. Domestically, maybe not in America because people don’t really know who Tyson Fury is, but in Britain, David Haye against Tyson Fury is a big fight. It’s an interesting fight and it’s one that regardless of what you think about boxing, whether you think it’s interesting or not, you can get excited about David Haye against Tyson Fury. It’s a big fight that people will be interested in because it’s heavyweight and because of the character that Tyson Fury is and because of the character that David Haye is. It will sell, it will be a big draw. Like I said, I think David Haye wins the fight comfortably by knockout but while it lasts I think it will be interesting. Jenna: Right well, Carl, I just have one final question for you. Over here in the United States you’ve been getting a lot of attention. You’ve earned a lot more fans. As a matter of fact when I talk to the casual boxing fans now, they’re even mentioning the name of Carl Froch. How do you feel now about not just being known in Britain but being known worldwide for the fighter that you are and for the fight style that you have? Froch: Yeah it’s fantastic. You know I’ve spent my fair share of time over in America and boxed the best, time after time consecutively. You know I thoroughly expect the boxing fans in America to pay attention and take notice of me, which they’ve been doing for a few years now. I get a lot of fan mail from the USA. It’s great that I’m now getting the acknowledgement that I deserve because to fight the resume of fighters I’ve fought time and time again consecutively it demands attention and respect. And that’s what I’m getting and it’s great and I appreciate it and thank you very much to my American fans. 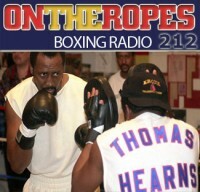 Jenna: It’s been an absolute pleasure having you return once again to “On the Ropes” Boxing Radio and thank you again for your time and I wish you the best of luck for the rest of 2013. Froch: Yeah definitely, the year of the snake by the way! The Cobra is on fire. Always a pleasure, thank you very much for having me. 5 Responses to "Carl Froch: “I THINK CANELO POTENTIALLY POSES PROBLEMS FOR FLOYD MAYWEATHER JR”"
Hey; wake up, Froch, Mayflower doesn’t fight the best of the best. He avoided Shane Mosley for 10 long years then fought him when he was already old, Totally evaded Antonio Margarito, Paul Williams and the greatest of them all (who else won 8 titles in 8 various weight divisions) Emmanuel Pacquiao. Long Distance Moving Company make your moving easy and very much less taxing. about how they appear in front of their friends or colleagues. failure is only a detour.